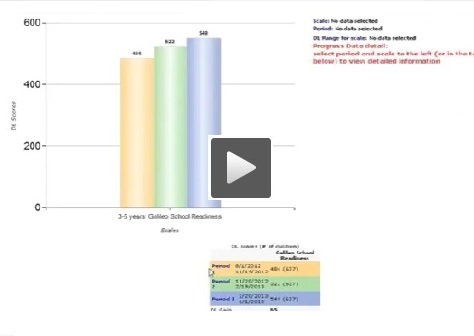 A research-based assessment, curriculum, and reporting system reflecting early childhood state standards, school readiness goals, and the Head Start Early Learning Outcomes Framework. 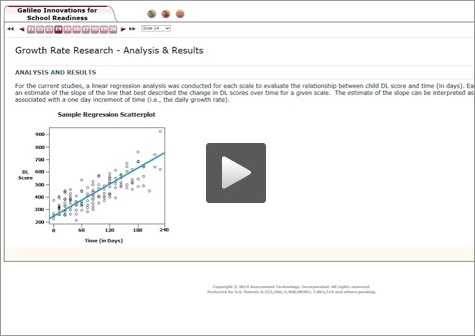 The system links planning, individualization, and program enhancements. 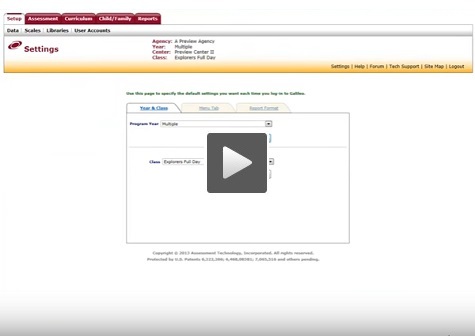 Learn about the latest system enhancements. 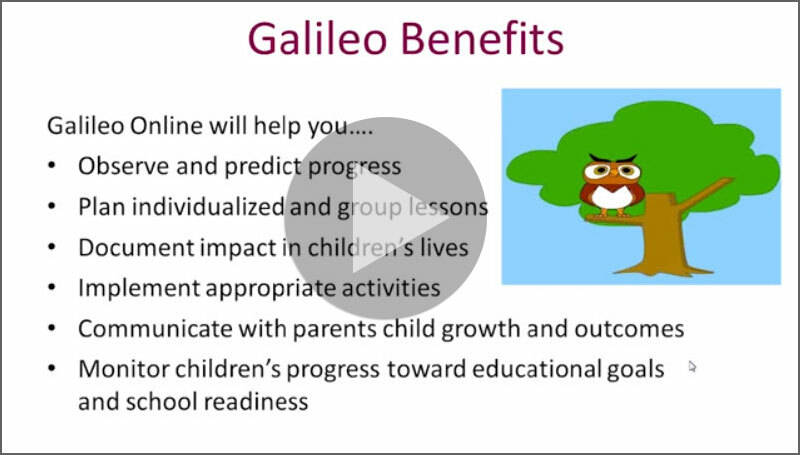 "Galileo Pre&hyphen;K Online has integrated curriculum, assessment and reporting to create a seamless approach to providing developmentally appropriate learning opportunities in the classroom which can lead to greater learning and increase school readiness …"
"Welcome to Pre&hyphen;K. This video will give you an overview of navigating Galileo Pre&hyphen;K Online and accessing the Galileo Pre&hyphen;K Curriculum tools …"
"Galileo Pre&hyphen;K provides early childhood educators … the complete and fully integrated online system. 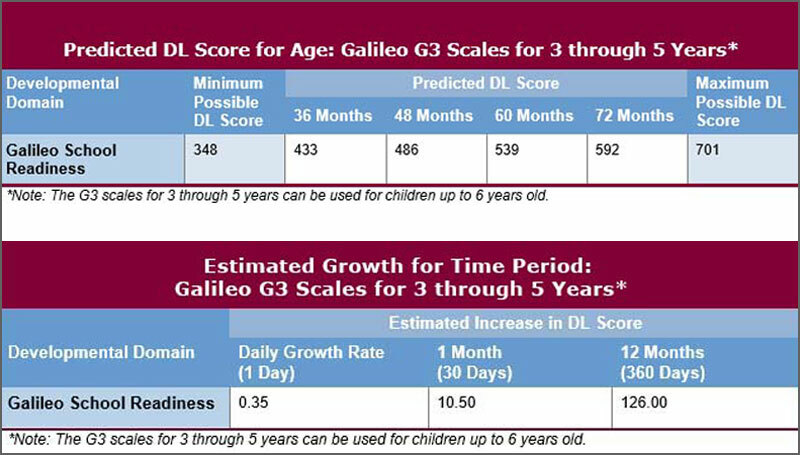 Galileo links components of assessments, lesson planning, individualization, and program progress …"
"We will demonstrate some of the key features of the Galileo Pre&hyphen;K Parent Center for both families and programs including how to use the Center to encourage family engagement." 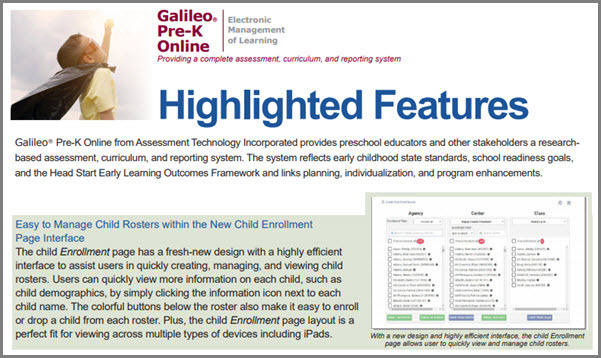 "the webinar illustrates several innovative and research&hyphen;based tools in Galileo designed to support the efforts of educators to establish school readiness goals and implement plans to support the achievement of those goals"
"This webinar illustrates new, innovative, and research&hyphen;based tools in Galileo Pre&hyphen;K Online addressing school readiness. 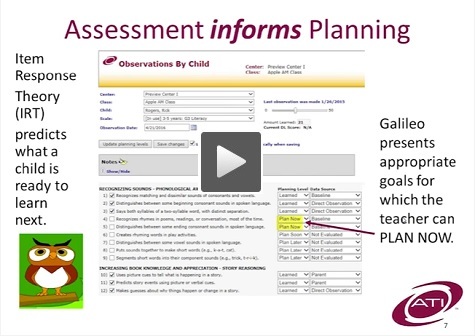 These advances are designed to support the efforts of educators to meet Head Start Program Performance Standards and Child Development and Early Learning Framework requirements for establishing school readiness goals and implementing plans to support the achievement of these goals."